If you’re anything like me, the mere thought of fitting your entire life into a single, solitary carry-on bag makes you break out in hives. So getting some tips for packing light might be just the thin for you! I am often staring wondrously at those passengers smugly bypassing baggage-check, leaving us poor schleps to wait in line just to dump our bulging 20kg’s. So how does a lady – with our hoards of products and piles of shoes – say ‘good riddance’ to excess baggage? 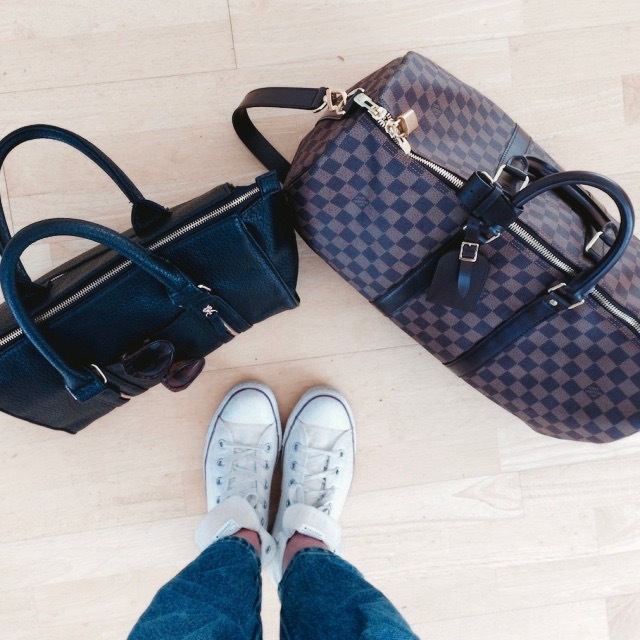 Here are 9 tips for packing light from the most seasoned of frequent flyers among us. Now you too can belong to the secret 7kg society even on the longest of domestic holidays! Go au-natural with make-up. Think minimalist chic and pack one good foundation, a stick of blush, mascara and if you’re destined for the tropics, some bronzer. Now is not the time to test out those five new lippy’s you purchased the other day. Hotels usually supply items such as shampoo, conditioners and lotions which can make your toiletries pack less hefty. If you’d rather sell your soul to Satan than part with your face cleansers and products, consider purchasing mini plastic travel containers from the chemist and transfer accordingly. Sample size toothpaste and perfume are a bonus and usually free to pick up from department stores! Employ the ‘buy it if you need it’ philosophy for all other toiletries. Australia is not a third world country. If you’re travelling into cooler climates, it’s a no-brainer to wear a number of layers on the flight. If the weather calls for a coat, pop that on too. Considering your core temperature drops a couple of degrees in the air, you’ll have attire to keep you extra warm and snuggly as well. Lay out all clothing and take a quarter of what you think you’ll need. Be ruthless. Sleep on it if you have too. Take lightweight layers and tops and only one or two skirts and pants. There is a certain art to packing properly and it is called ‘the roll’. Those unfamiliar with the technique need not be alarmed because it is very simple – just roll your clothes. It will maximise space and minimise creasing. There’s a reason why ladies wear their high-heels on the flight. Shoes, in particular stilettos and boots, take up the most room in your carry on. It’s one or the other. I know, it’s hard, but are you going to do more partying or walking on this trip? Make a choice, mourn, and move on. To lessen the blow of the above, pack a nice pair of sandals or ballet flats – if they are ballet flats and can be folded – even better! Remember that your carry-on bag is the one being weighed prior to the flight; you are not. It is for this very reason that piling as many fun jewellery pieces onto your person pre-flight is a good compromise for your limited clothing wardrobe. And that’s about it people. Those 9 tips for packing light will be sure to get rid of some extra kilos for your next flight; your body (and sanity) will thank you for it.